Spring is Officially Here, and it's time to inject a little colour into our lives. Who's going to join me for a Monday sing-along? YOU: Emily & Fin Jessica dress, £69, Kiki's Boutique. Clouds and birds - what more could you want from a springtime dress? It pretty much sums up the season. Prettily. YOUR HOME: Pipework Series Candelabra Three candlesticks, £58, Culture Label. There's something about combining a flickering flame with stark pipework that is just so beautiful. 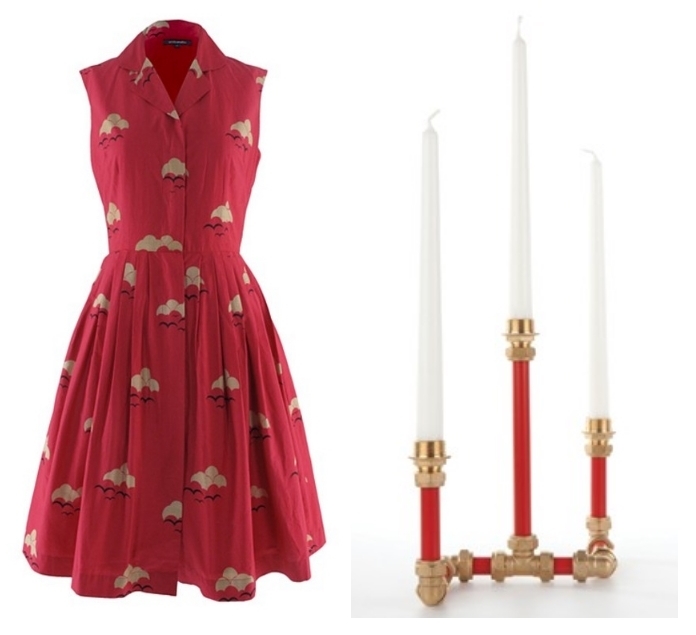 Team with contrasting candles for the ultimate colour pop. YOU: Deena + Ozzy Lana wedges, £48, Urban Outfitters. WARNING - keep away from puddles in yellow suede. It can only end in tears and cold toes. YOUR HOME: Tommy desk lamp, £15, Habitat. 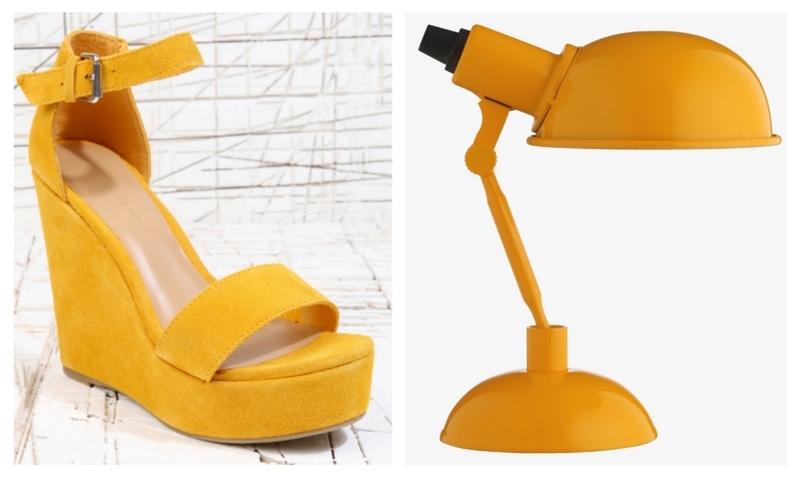 Beam some sunshine on your desk with this bargainous Habitat lamp. YOU: Bourjois limited edition vintage blusher in Rose Brune, £7.99, ASOS. A flush of cheeky pink, and a pot which apparently loves you. Win-win. YOUR HOME: Mini colour block sewing machine, £49, John Lewis. Feeling inspired by The Great British Sewing Bee? This basic sewing machine is purse-friendly, but offers a good choice of stitches and functions for a beginner seamstress. Also, PINK. YOU: Messenger box bag, £25.99, Zara. The perfect shade of grass green, and big enough for a notebook, novel, sarnie and camera. Sling it over your shoulder and go exploring! YOUR HOME: True Grace Curious No.45 candle, £28, John Lewis. With notes of leather, flowers, vanilla and cardamom, this candle straddles the seasons. We're rather taken with True Grace's Library candle, too, but, like, it totally didn't work with my rainbow theme. YOU: Parklife platforms, £45, ASOS. These platforms are equal parts mental and marvellous. Needless to say, I want them with every fibre of my being. YOUR HOME: Drip vase, £35, Habitat. 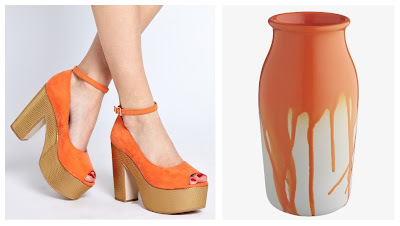 Not ready for full-on orange in your living room? This vase gives you a splash (literally) of colour without being overpowering. Fill with all-white flowers for maximum impact. 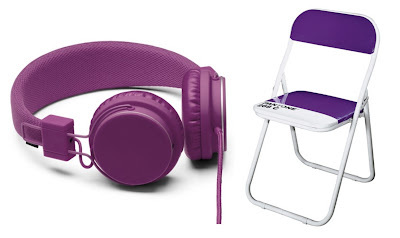 YOU: Plattan headphones in Grape, £49.90, Urbanears. These Urbanears headphones sound as good as they look (I have them in Harris tweed). Plus, there's a special plug so your friends can wire themselves into your tunes - just the thing for springtime adventuring on trains, planes, and automobiles. YOUR HOME: Pantone folding chair, £55, Urban Outfitters. Nope, I'm still not over Pantone. These fold-away chairs are great for small houses - you'll never have to fashion a seat out of a bucket and a crate ever again. YOU: Surrender bow platforms, £68, Topshop. These cobalt platforms are terrifyingly high, but I'm hoping the platform will help. Or lessen the fall, at least. YOUR HOME: Rob Ryan Astonish Me mug, £21, Soma Gallery. Be astonished every time you have a cup of tea courtesy of Mr Ryan. YOU: Ice Neon nail polishes, £20 for a set of five, Models Own. So, apparently we have to keep these neon nail polishes in the fridge for ultimate fluorocity (I think I made that word up. Pretty good, isn't it?). Wear a different shade on each nail - spring's no time for being too grown-up. 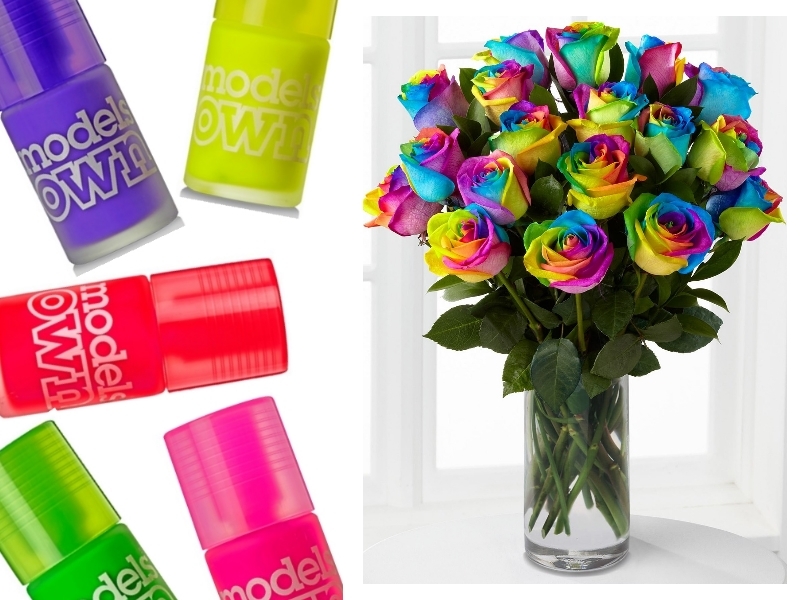 YOUR HOME: Rainbow roses vase, £44.99 for 12 stems, Interflora. Mind: officially blown. There's a nifty bit of jiggery-pokery science behind these multicoloured roses from Interflora, but it's way too much for me to explain here. Rainbow roses were being flogged for about £20 PER STEM when they first launched in this country a couple of years ago - now you can get a dozen for £45. Just the flowers for that special someone in your life whose favourite Mario Kart racecourse is Rainbow Road. Oh, we all know one of them. Aren't they tedious? Anyway, will you sing a rainbow too? I HATE Rainbow Road. I just refuse to play that course. It's rubbish and I sulk every time I fall off (so, every two seconds). I want bloody everything in this post. Damn. I was enjoying this so much - and then I remembered the rainbow road song, and my flatmate who used to sing it all the time. Totally not your fault though, just some part of my brain determined to PUNISH ME. Isn't Rainbow Road just the most annoying thing ever? Luckily rainbow roses are silent. And still.